If you're growing miniature roses indoors, you'll have success with these tips for miniature rose care. Miniature rose plants can be found for sale in florist's shops around Valentine's Day and Mother's Day. Although these pint-sized beauties are popular gifts, they're really better off as temporary house guests. Their true home is outdoors, where they'll thrive in the sunshine and fresh air. Nearly every garden has space for growing miniature roses. Plant them in borders, or in front of your tall rose bushes. If you don't have a spot in your garden, you can keep your minis in pots on your sunny porch or patio. Their petite 1-2 in (2.5-5 cm) flowers are available in a big range of colors, including red, pink, peach, orange, white, yellow, and many combinations. Some are shrubs and some are climbing. Train climbing miniature roses on a small trellis. Dozens of excellent varieties are available. The difficult part is choosing among them. Award-winning 'Cupcake' blooms abundantly in pale pink...'Innocence' is white with a blush of pink...'Caliente' is stunning with bright-red blooms and glossy foliage. Orange-red 'Starina' gets top honors from the ARS... 'Lavender Lace' has large, mauve blooms... and 'Beauty Secret' is rich, radiant red. Among the tiniest minis are white 'Cinderella' and 'Popcorn'... pink 'Bo Peep'... and yellow 'Littlest Angel'. Looking for a fragrant mini rose? All the Scentsation varieties have an intoxicating fragrance. Let the sun shine in. These mini and micro hybrids won't bloom if they don't get enough sunshine. When growing miniature roses indoors, it can be challenging to find a spot where they'll get several hours of direct sun each day. If you don't have space in a sunny window, you can move your rose outdoors, as long as there is no danger of frost. Water regularly. Flowering roses are thirsty, and they dry out quickly in containers. Stick your finger in the soil to check for dryness every day or two, especially if you're growing miniature roses outdoors. Deadhead spent blooms. Remove flowers as soon as they fade to keep plants looking their best and to encourage a long blooming season. Don't pluck them off with your hands because tearing can damage the stem. Use sharp pruners to avoid tearing the stems, which can attract disease. Cut at a 45° angle. Pruning miniature roses. New plants won't need pruning. As they get older, you'll want to remove dead branches or any cross branches that rub against each other. Don't be afraid to prune it back hard in fall, after flowering. Yearly pruning will promote vigorous new growth as well as the overall health of your rose. It also gives it an attractive shape. Use clean, pruning shears to cut the stem at a 45° angle, 1/4-inch above a leaf axil. Repot year-old roses. Potted plants or gift baskets sometimes contain more than 1 rose plant per pot. This is a good time to divide them. Tease apart roots with your fingers, removing as much of the original soil as possible and plant separately in small pots with drainage holes. Repot in fall, after the flowering season is over. Overwintering your plant. Roses go dormant in winter and will drop their leaves. Giving roses a rest period in winter will prolong the life and health of the plants. Keep them cool during this time. They're cold-hardy, but if you're growing miniature roses outdoors, protect them from freezing temperatures by covering them with a layer of mulch. Move container-grown roses to a basement or garage for the winter so that roots don't freeze. 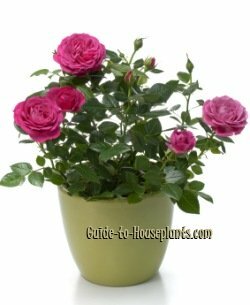 Miniature rose plants are just as susceptible to the same ailments that afflict any other roses. Damp conditions can cause blackspot to develop on the leaves. It's a fungus that needs to be treated right away. Cut off affected leaves and treat foliage with a fungicide specially made for blackspot. Good air ventilation will help to prevent fungus. Fortunately, newer rose hybrids are more and more resistant to diseases. Yellow leaves that drop off can be a symptom of a few things. Lack of sunlight, dry soil, and dry air will cause roses to shed their leaves. Resuming good care of miniature roses will help them recover. Light: Bright light, with as much direct sunlight as possible while plant is growing. Water: Water thoroughly and allow the top 1 in (2.5 cm) to dry out between waterings. Keep soil barely moist in winter. Avoid getting water on the leaves, which can cause blackspot. Humidity: Maintain at least 40-50% relative humidity. Use a humidity tray or room humidifier. Rose buds that shrivel up before opening may be suffering in the dry air of a heated home. Prune off the shriveled buds and raise the humidity around the plant. Moving the plant outdoors may be just the cure. Temperature: Average room temperatures 60-75°F/16-24°C will suit growing miniature roses fine. 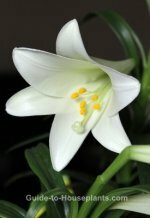 Established plants will tolerate varying temperatures. Roses are cold-hardy, but potted plants, especially, need extra protection from frost. Soil: Any good potting mix with neutral pH (pH 7). Fertilizer: Feed every 2 weeks in spring and summer with a high-phosphorus fertilizer (such as 6-12-6) that contains micronutrients, diluted by half. Propagation: Take 4 inch (10 cm) stem tip cuttings in early summer. Dip cut ends in rooting hormone powder and plant them in moist potting mix. Maintain high humidity.